Caption slip reads: "Photographer: Gray. Date: 1958-07-27. Reporter: Donoghue. Assignment: Boys Apparel Guild. Special instructions: Daily. 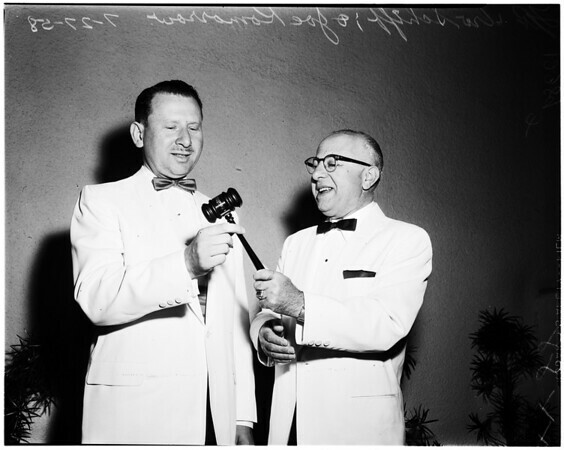 87/88: Irv Schiff, president of Ronnal of California, is installed as 1958-59 president of the Boys' Apparel Guild in California. L to R -- Schiff and Joe Komarrow, treasurer and installing officer. Gavel is gift of membership to incoming president".